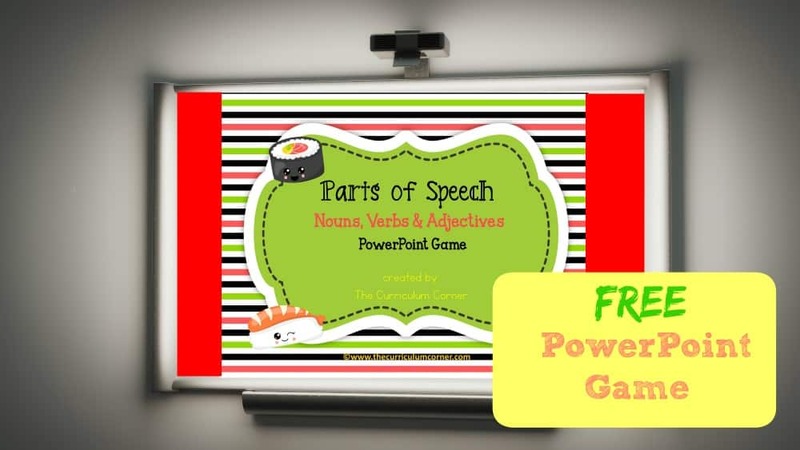 This parts of speech PowerPoint review game is designed to be a refresh game for your students. 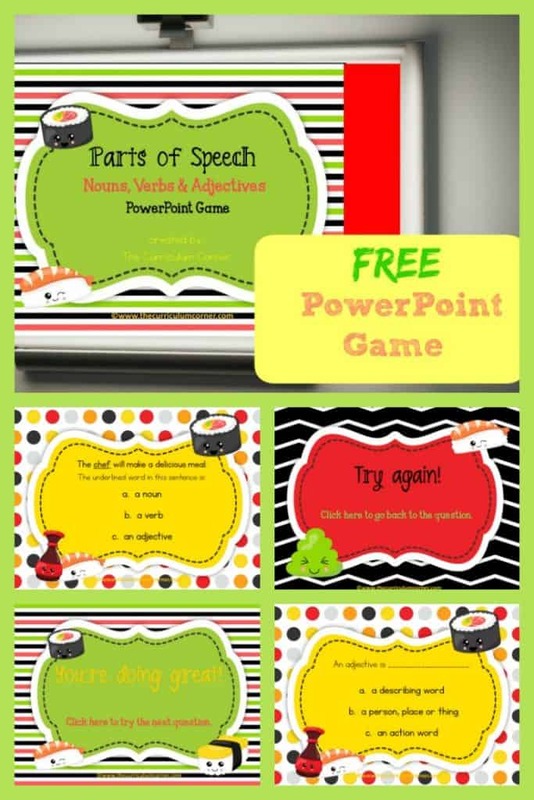 This free parts of speech review game is designed to be a review for students when used in intermediate classrooms. We know students should have mastered this skill by now, but so often they are in need of a review! You can download this free parts of speech game by clicking on the bold link at the bottom of this post. As many teachers are moving towards classrooms with less paper, we are trying to help by creating new resources to fit. You can use this type of game at a computer center. We are planning to create a larger collection of different skill games to be used on your interactive whiteboard or at student computers. The PowerPoints will cover a wide range of math and literacy skills. Our hope is that you have an assortment of interactive options at your disposal. Use these when you introduce a new skill or concept or when you need your students to practice. Set this up on your student computers for morning practice or during literacy centers. To use this with your whole class, display a slide with the problem and then give students time to think through the answers. You can have a volunteer click on the answers as you go. Students can self check and get excited as they see that their answers match the correct answers on the PowerPoint presentation. This game focuses on identifying nouns, verbs and adjectives with a sushi theme. Correct answers are praised with a praise slide. To play, students need to click on the “Click Here to Start” link and they will be taken to the first problem. When a problem is answered correctly, they will receive slide giving them some praise. Students click on the wording and are taken to the next problem. Students must click on the actual text for the slides to correctly work. When students answer a problem incorrectly, they will reach a “Try Again” slide. Students will need to click on the words to be taken back to the original problem to try again. This sushi themed game is created so that the final slide is linked to return to the first slide. If you have ideas for new literacy skills you would like to see games created for, please send us a message. We want to make sure the games we are creating will fit what teachers need in the classroom. Thank you to PrettyGrafik Design on Etsy for the cute sushi clip art!